Two goals from Matty Williams ensured The New Saints completed a domestic treble after beating 10-man Newtown 2-0 in the Welsh Cup final. Newtown held the Welsh Premier League and League Cup champions scoreless in the first half at Latham Park. But Williams popped up after half-time to break the deadlock. Saints' victory was assured when Newtown's Shane Sutton was sent off for a foul in the area and Williams stepped up to convert the penalty. 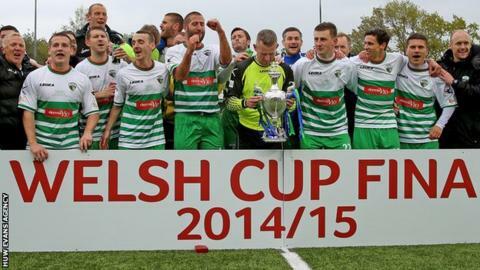 The Welsh Cup result now means that the Europa League qualifying place now reverts back to the league, with Airbus UK Broughton joining Bala Town representing Wales in the 2015/16 competition. The other Europa League place will be decided by a play-off, with Port Talbot Town facing Newtown AFC and Aberystwyth Town taking on Gap Connah's Quay in the semi-finals on the weekend of 9-10 May. The highest remaining seeded club will host the Play-Off final.